Gem Mining RAIN or SHINE! Located in charming downtown Hendersonville, NC – We are OPEN YEAR-ROUND and proud to offer a large 60 foot indoor gem mining sluice! 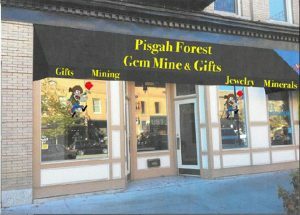 The Pisgah Forest Gem Mine is GREAT FUN for everyone! Be sure to visit our unique Retail store, featuring Kerusso Christian t-shirts, bear souvenirs, fine jewelry, rocks, gems, and minerals, and much more. Large groups welcome! Make it a family day of gem mining, and exploring the area. We have the perfect bucket of rich gem mine ore waiting for your family today! Large groups welcome! 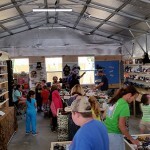 Make it a family day of gem mining, and exploring the area! We have the perfect bucket of rich gem mine ore waiting for your family today. Fun for all ages!